We can take it for granted that Lady Huntingfield would have been a member of the English aristocracy, but her obituary in The Argus has other more immediately interesting facts. She died in 1943 in London soon after her home was bombed during the blitz of World War II. Immediately before the war, she lived in Melbourne with her husband, who was governor of Victoria from 1934 until 1939, with a nine month spell as Acting Governor General of the Commonwealth during 1938. "Lady Huntingfield was before her marriage Miss Margaret Eleanor Crosby, and was born in the United States, her father being Judge Ernest Crosby, of New York. She was married to Lord Huntingfield when he was Capt Vanneck and stationed with his regiment in India, whither she went with her father to attend the Coronation Durbar in 1912." The Delhi Durbars, of which there were three at the height of the British Empire, were held to mark the coronations of English kings and queens. The 1912 show was for King George V and the Queen Mary (known for years as the Queen Mother). Nearly every ruling Indian prince, nobleman and person of note went along to honour the royal couple who wore their Coronation robes and also an astonishing amount of jewellery. These details fitted with ideas I had grown up with about the role in Australia of the rich, English noble class, but I was to learn further that they were not the whole picture. "In Victoria, Lady Huntingfield identified herself with every movement for the advancement of citizens and improvement of social conditions. With Lord Huntingfield she travelled extensively through country districts and won esteem everywhere by her grasp of the problems facing men and women in a new country." In keeping with her interests, her name was given to a bed in the Queen Victoria Hospital, a scholarship for a social work student at the University of Melbourne and our North Melbourne kindergarten. When she lived in Melbourne, the women's pages of the local press pictured her as part of an extraordinary world: at the races Lady Huntingfield wore 'a tailored suit of black cloth with a black felt hat and silver fox furs ' (The Argus, 28 May 1934, p. 4). She also opened a handicraft exhibition for the Country Women's Association where the floral decorations ran to a profusion of 'mignonette, violets, late autumn roses, forget-me-nots, sweet peas and lily of the valley' (The Argus, 18 June 1935, p. 12). Her doings were regularly reported alongside details of weather, flowers and frocks at dances, balls, unveilings and openings. Funds for the kindergarten that would carry her name came in large part from a 1940 garden fete held in October in the grounds of Melbourne University. The day's program featured bridge at Chancellor Sir John Medley's residence, stalls for sweets and flowers, pony rides for children and music from the Fire Brigade Band. The press detailed these attractions, a short list of those who attended and the headline 'Fete at University to Benefit Needy Children'. There was continuing support and interest from lord mayors, the Committee of Melbourne University Women, its Students' Representative Council and representatives of Women's College and Janet Clarke Hall. 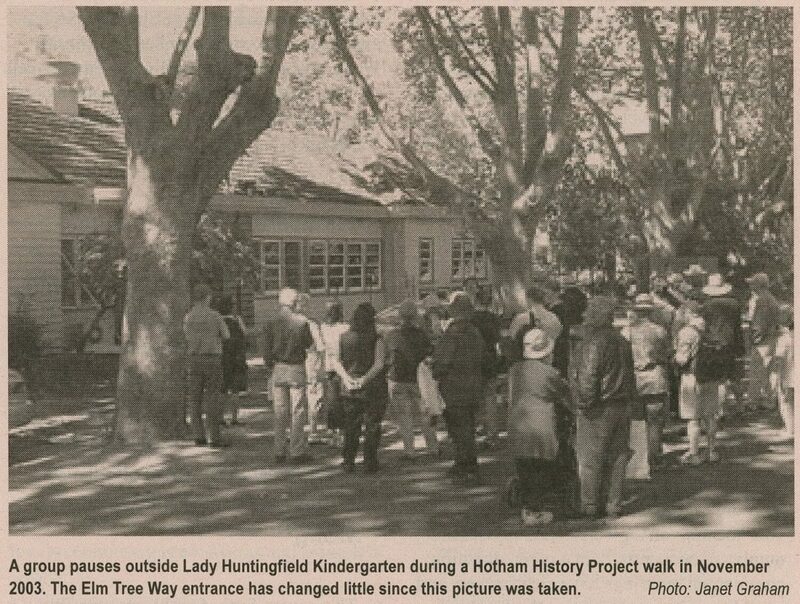 Thus, in the spirit of 'doing good', the kindergarten opened under the auspices of the Melbourne City Council and the Free Kindergarten Union and carried the name of an interesting and well intentioned woman, one of the commoners who married into English aristocracy. by Loma Hannan for the Hotham History Project, 2011.